The ladle is put into the vacuum tank to stir the melting steel in the vacuum to conduct degasification of hydrogen and nitrogen decarbonization and removal of non-metal enclosures. 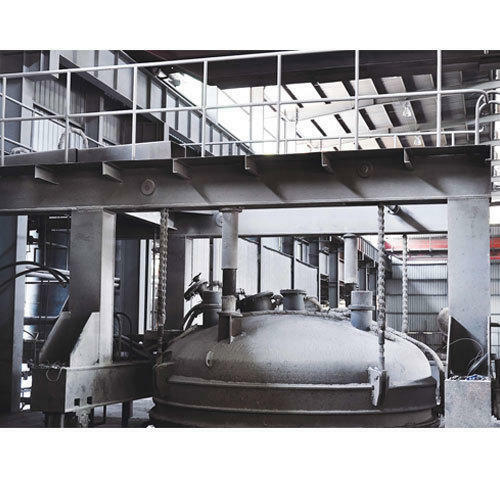 The Vacuum degasser, Vacuum oxygen decarburization is installed on the same line as the LF equipment; and the LFR, Ladle refining furnace equipped with vacuum degassing equipment. Which has heating function of heating the temperature reduced melting steel, is also available. To control pouring temperatures, especially for continuous casting operations. Vacuum degassing processes of molten steel to a low-pressure environment to remove gases (chiefly hydrogen and oxygen) from the steel. The effectiveness of any vacuum degassing operation depends upon the surface area of liquid steel that is exposed to low pressure. The mechanisms of hydrogen and oxygen removal from liquid steel are related directly to surface area. Hydrogen removal is a diffusion and partial pressure phenomenon. Oxygen removal is a function of chemical reaction of oxygen with carbon and the partial pressure of carbon monoxide. The processes of degassing treatment : composition and temperature control; decarburization; micro cleanliness; and inclusion morphology. Under the vacuum degassing treatments three processes which primarily use this treatment are stream degassing, recalculation degassing and vacuum degassing in the ladle can posible.